Vintage King USA calls it “The Mercedes of VCA Compressors”. 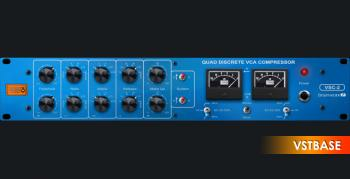 The original hardware Vertigo VSC-2 Quad Discrete Compressor built its reputation largely on the four, custom hand built, discrete “1979” VCAs used in its design. The plugin version of the VSC-2 captures every nuance of the hardware version and puts it right into your digital audio workstation. The VSC-2 is Vertigo’s first plugin release, made in close cooperation with Brainworx, and based upon Vertigo’s “Big Impact Design”. The VSC-2 plugin captures all the fine nuances of this $6,000 flagship VCA compressor. Although the VSC-2 was developed as a Stereo Bus Compressor, each channel provides a complete set of controls that also allows the VSC-2 to function as a dual mono device in recording and mix situations. Plus you get a mono version for mixing situations, of course. Other unique and innovative features lie beneath the bonnet, such as the ratio, which increases with amplitude in “Soft” mode. In this mode, the ratio positively corresponds to increasing input level, “tip toeing” in smoothly. Ratio variable from “soft mode” through compression ratios of 2:1, 4:1, 8:1 and 10:1 all the way to “Brick” mode. Brick Mode: In Brick Mode the VSC-2 becomes an analog Limiter, effectively cutting off Signal Peaks at the set threshold. SC Filters: These switches control the sidechain filters. In the 60 Hz or 90 Hz positions, those frequencies will be largely ignored by the compressor. In the off position, the sidechain filter is removed from the circuit. Q) Did Plugin Alliance change the protection? just C&R protection using SHA256/RSA2048/RC4/BASE64. Q) What the bad point of PA-Layer? Is it removed from R2R release? performance, compare the latest one with the one from PA All Bundle v3.0. releases and you will have any bad points of PA plugins. Q) Why AAX got cracked and appeared beside the VST version? NOTE : AAX Crack by VR will crash randomly due to the bad bomb dealing. Generate, Test custom loaders for VST2/VST3/x86/x64, for 90 products. Q) I thought R2R was paid by Plugin Alliance to stop cracking.